This photographic technique, resulting in the most surprising images without chemicals, was invented by Slawomir Decyk, Pawel Kula and Diego Lopez Calvin. They called this kind of images solarigraphics which came into being in cameras without lenses. Light sensitive material is exposed in such a way that the image is revealed directly, without the use of further chemical processes. 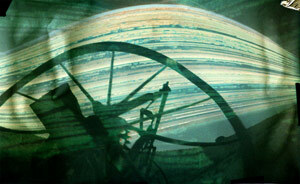 Solarigraphics are images that register the traces of the movements of the Sun. This method allows for extremely long exposure time (as long as six months). 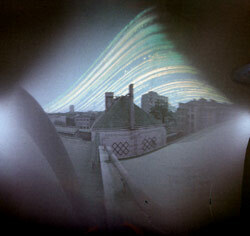 from stettin (przemek jesionek), but were not known as solarigraphy, just known like a photographic tecnique and effect. And this is just a feature of foto materials, but also u know that when solaris proyect was born all change, and we gave a name for this. The most important was that it consist in make 2x6 months exposition simultanously in diferent places, and also to have in publicated in website to make possible all participants see it so : Diego Lopez + Pawel Kula + Slavo Decyk are creators of this project 2000€‘ 2001. I think i did first 5 months exposure in solarigraphy tecnique, thats means without chemicals i will send it to u in email." The inventors of solarigraphy photographed with this method their project called Solaris in 2000-2001. Ramon Chomon has also been working with solarigraphics since 2001. 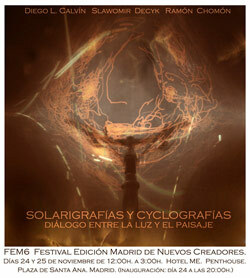 He belongs to the same group whose exhibition of solargraphics and Decyk´s cyclographics were shown in Madrid in FEM6 (festival edicion madrid de nuevos creadores) in November, 2006.